Last Saturday, Rhonda and I welcomed eight of our closest friends to my house for our fourth annual White Truffle Dinner. It was a stormy night, requiring our guests to negotiate traffic snarls, power outages, and bursts of torrential rain just to make it to my front door. But one by one they arrived, until the last of them rang the doorbell at just a few minutes before 7:00 p.m. In this first installment of a multi-post series, I'll describe some of the activities that had filled the weeks, days and hours leading up to that moment. Then, in subsequent posts, I'll take you through each of the eight courses that we presented as part of this dinner. I typically start to think about the White Truffle Dinner sometime around mid- to late September, when summer vacations have ended and fall has definitively arrived. 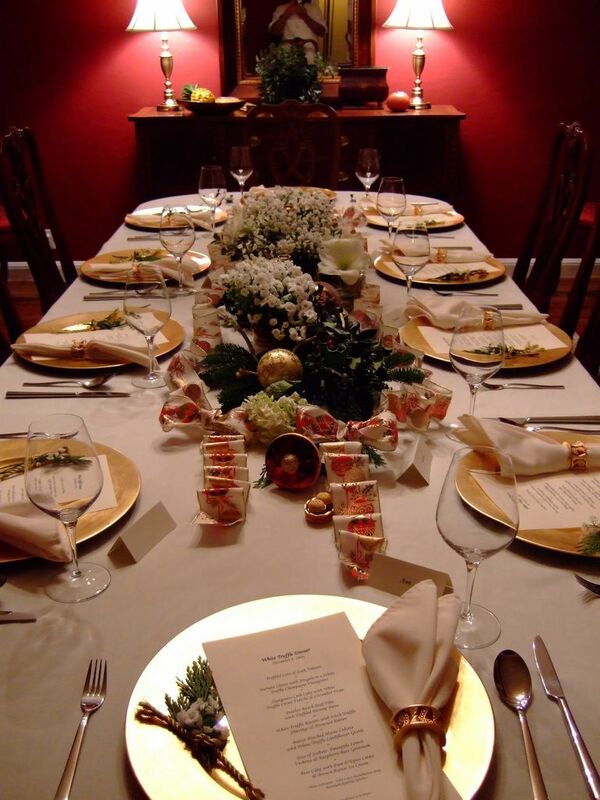 For the first several weeks, the dinner is little more than a distraction in the back of my mind -- a subtle and infrequent reminder of a new item on my to do list. By late October, however, the task has become a bit more concrete, and I'm thinking about dishes from the prior year's menu that I would like to replace and new ideas that I'm interested in exploring. November brings experimentation with new ingredients, combinations, and recipes, as well as finalization of the menu over the Thanksgiving break. The last few weeks before the party are then consumed with sourcing ingredients, taking care of other logistics, and getting mentally prepared. And all throughout, I rely upon Rhonda as both a taste tester and a sounding board. This year's preparation followed the same basic progression as always, but my timing was seriously off; a rough period at work put me 2-3 weeks behind schedule from the outset, and I never did manage to catch up. Thus, my experimental phase did not even begin until the weekend before Thanksgiving, when I tried preparing three components of the dessert that I had in mind. While two of these seemed to turn out relatively well, the third -- a sauce -- clearly needed a few more iterations before I could be comfortable that it would work. Unfortunately, I would end up having to wait another two weeks before I could resume my tinkering with that sauce. My Thanksgiving break was a flurry of activity, with very little of it directed toward planning the White Truffle Dinner. My parents were in town for the holiday, so between hosting them, planning and cooking our Thanksgiving dinner, and tending to a few nagging issues that bubbled up at work, I had absolutely no free time. I did continue to churn a few ideas around in my head, though, and I also managed to map out the series of tests that I would need to run during the one weekend that remained before the party itself. The spread for Course 2, the vegetable components for Courses 3, 4 & 6, the entirety of Course 7, and the sauce for Course 8 -- not a single one of these had been proven viable, and all were accordingly up in the air. 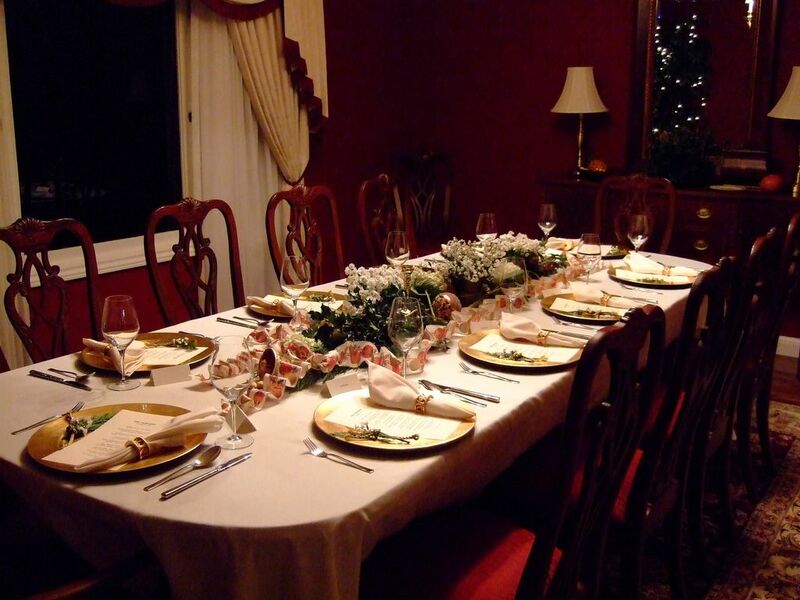 There was, however, one inspirational spark that came out of our Thanksgiving dinner: the vegetable side dish that we had prepared struck me as a great fit for Course 6, thus eliminating one point of uncertainty! 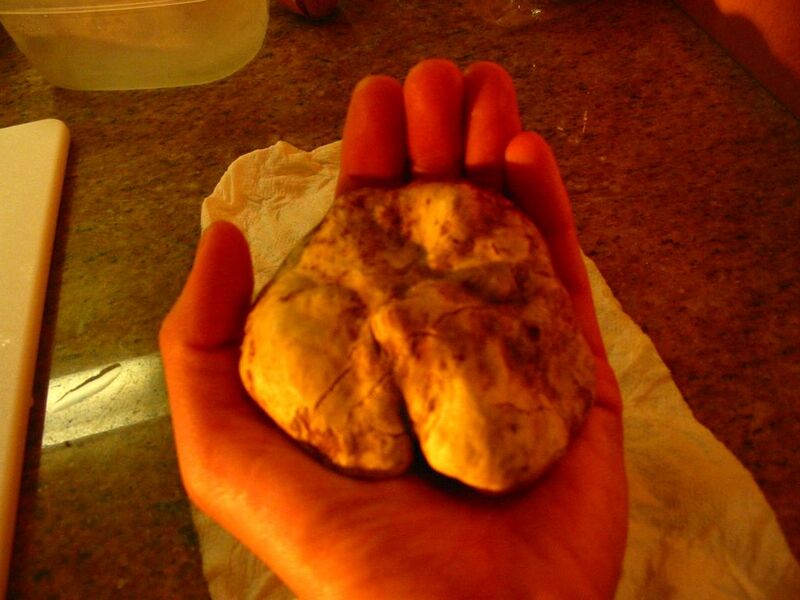 The weekend before the White Truffle Dinner was completely insane. I woke up at the crack of dawn that Saturday, got dressed, and headed out to the Ferry Building Farmers' Market to get a variety of ingredients. After stopping at Whole Foods to pick up a few additional items, I came home and unpacked. And then I cooked. I peeled, chopped, boiled, pureed, soaked, measured, seasoned, infused, strained, juiced, gelled, processed, whisked, tempered and, of course, tasted. There, in the solitude of my kitchen that day, I experienced triumphs, tragedies, trials and tribulations. And after working into the wee hours of the morning and sleeping for a few hours, I woke up to do it all again. I took extensive notes throughout that weekend -- writing down weights, volumes, measurements, and yields, and penciling out calculations and conversions in the margins. By the time Monday morning arrived, I was exhausted. But I had somehow succeeded in finalizing almost all of the previously open menu items, with each having been tested and tweaked to my satisfaction. Yet, there was one important exception, an item that would end up being the subject of several mid-week experiments to be run after long days at work: the vegetable component for Course 3. But more on that in a later post. The other major task facing me at this point was to place my order for certain key ingredients. For three years running, I have ordered our lobster tails from Maine Lobster Direct. I have always been pleased with the service provided by this company, and the quality of the lobster has consistently been first rate. I called them up, asked them to replicate my order from last year, and was off the phone just a few minutes later. that any truffle I ordered would be at least 8 days old by the time we served it. After hearing me express some concerns about this, the agent assured me that it shouldn't be a problem and that he would personally check the quality of the truffles the next morning. On Tuesday, however, he called me back to say that the truffles had started to deteriorate, and that he would not recommend that I order these for my dinner. I thanked him for his honesty and integrity, and noted that he had just guaranteed that D'Artagnan will have my business next year. It was now Tuesday afternoon, and I had no idea who would be providing the truffles that we intended to serve just four days later. Draeger's in San Mateo often carries them at this time of year, so I decided to stop by on my way home from work in order to investigate. Although they did have a few white truffles available, the quality looked marginal and I had no way of determining when they had been pulled out of the ground. I resolved to keep looking. 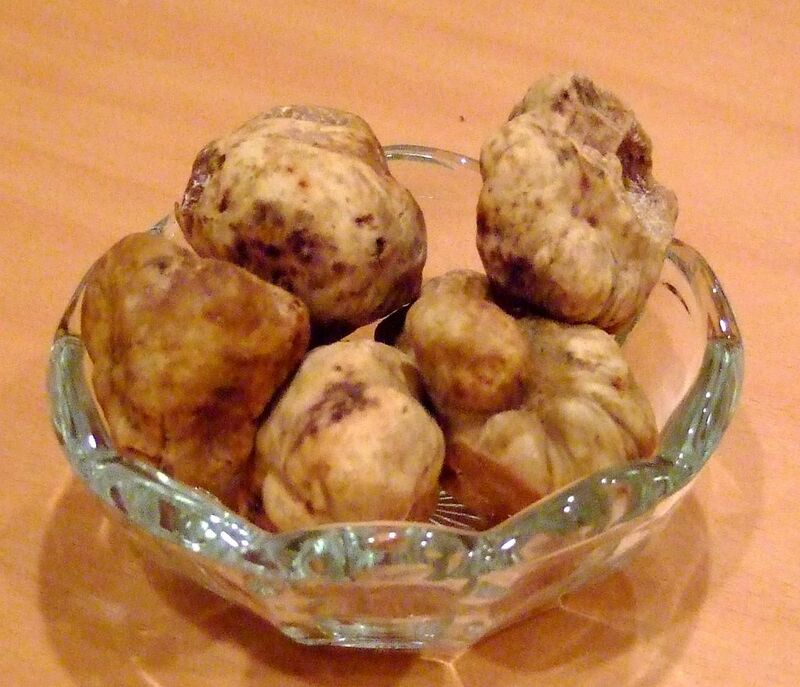 I recalled seeing a few truffles at Far West Fungi in the Ferry Building a few weeks earlier, so I gave them a call. I was told that they would be getting a fresh shipment in on Wednesday morning, perfect timing for our purposes. But they were charging over $210 per ounce -- nearly $70 per ounce more than the rate I had been finding elsewhere. I am generally a fan of Far West Fungi and believe in supporting local purveyors, but forking over an unnecessary $350 to them was a bit more than I could stomach. After doing some online research on Wednesday, I placed an order early Thursday morning with Earthy Delights. The service provided by this Michigan company was very good, but the truffles themselves ended up being of mixed quality; some were excellent, but others were just average. I was also disappointed to see that they had stored the truffles in rice -- a practice that, while mystifyingly popular, tends to dry the truffles out. I always take the Friday before the party off in order to cook, so Thursday was my last day in the office. After finishing my work that day, I stayed a bit longer to finalize a few of the documents that we would need for the party. 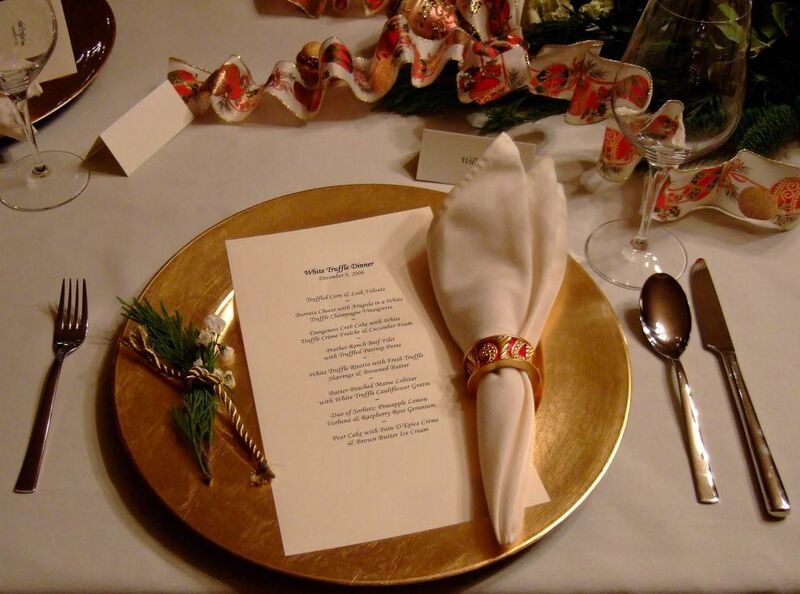 First up were the menus that would be placed on the table before our guests arrived, then came the placecards. Finally, I turned my attention to the most important document of all: the one containing the recipes. 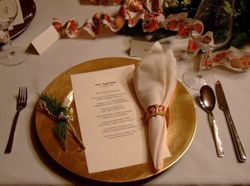 Back when I was planning the first White Truffle Dinner in 2003, it occurred to me that the only way to execute a complicated, multi-course menu without missing something along the way was to have every step -- and the relative timing thereof -- plotted out well in advance. The result was a 17-page "guide" of sorts, a step-by-step plan of attack for getting all seven of the courses to the table in the form and sequence that I intended. This proved so invaluable during that first dinner, that I've been using it ever since. The document itself is divided into eight sections, each with a large heading containing a course number. Immediately below that is a list of the ingredients for the corresponding dish, properly scaled to reflect the number of servings that we are preparing. The cooking directions come next, and they are subdivided into three distinct parts: those steps that should be completed in advance (i.e., the day before, or the morning of, the dinner), those that should be done the afternoon before guests arrive, and those that must be completed in real time during the dinner itself. Each section then ends with a description of how the course should be plated. I usually print several copies of the document and distribute them across various counters in the kitchen, so that Rhonda and I have ready access to the information no matter where our running around may take us. I had been hoping to go the grocery store on Thursday evening, but the hours simply slipped away from me. Accordingly, I woke up early Friday morning, prepared a list, and headed out to get the panoply of ingredients that we would be needing. I returned home around 11:00 a.m. and immediately started to cook. 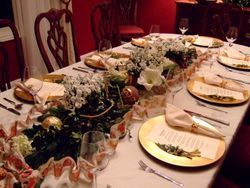 Rhonda, meanwhile, was out running a number of errands, most notably shopping for items to include as part of the table decor -- which I had entrusted, as I always do, to her capable hands. I worked methodically through two components for Course 8, the entirety of Course 1, and a portion of Course 3. Rhonda joined me in the kitchen in the early evening, and she tackled portions of Courses 2 and 6. We continued to cook until nearly 3:00 a.m., when we collapsed due to sheer exhaustion. We were up by 8:30 the next morning, off to the Ferry Building for some fresh ingredients that we had deliberately waited to buy. I was back in the kitchen by 11:00 a.m., addressing parts of Courses 3, 4, 6, and 8. 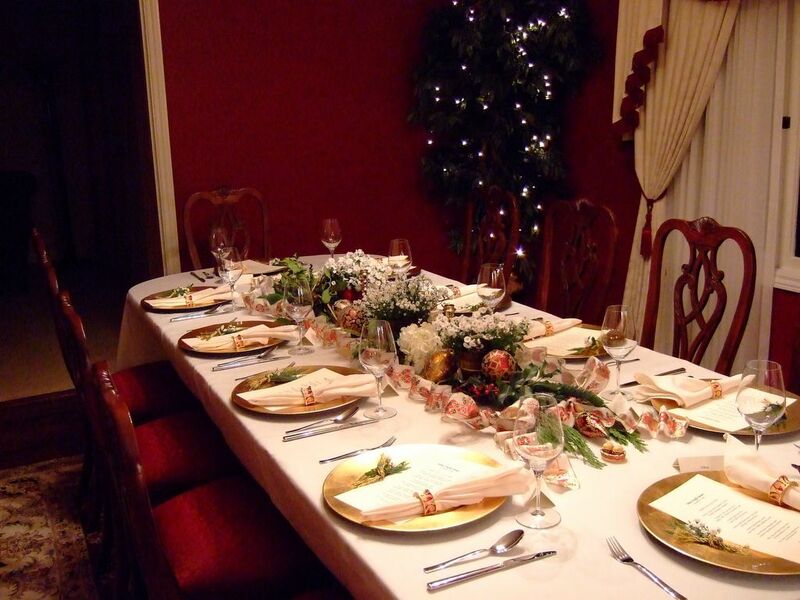 Rhonda worked on getting the table set up, after which she took on certain aspects of Courses 3 and 5. Our efforts continued uninterrupted until around 5:15 p.m., when I finally paused to take a quick shower and get ready. Shortly after 6:00 p.m., our first guest rang the doorbell. I have scattered throughout this post pictures of the table decor that Rhonda put together for the evening. While Rhonda has always had a flair for aesthetically pleasing style and design, she really outdid herself this year -- creating a spectacular arrangement characterized by clean lines, elegance and refinement. I'm still not entirely sure how she did it; then again, that's probably why I leave these matters to her eminently good taste! Our guests were as impressed as I was, and the table was the topic of conversation as I finished the final preparations for Course 1. You are so well organized - a 17-page document? I am incredibly impressed. 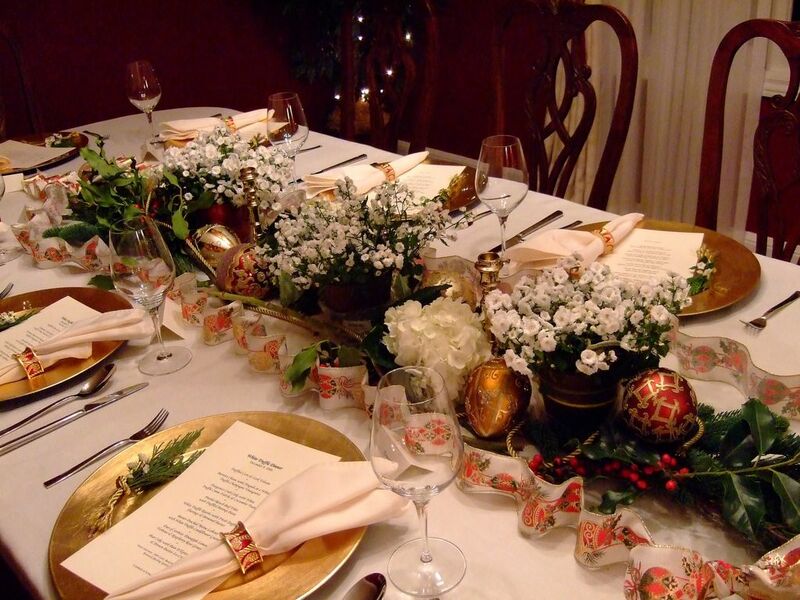 The table decor is absolutely gorgeous. Hive five for Rhonda! I agree. You are well organized! And the table decor is beautiful! Can't wait to hear and see more. NS: Uh, they got *restaurants* for this! Just kidding. I bet you and Rhonda had a blast putting it together. Jennifer, Kat & Cookiecrumb: Believe me, I know -- the months of obsessing, the weeks of experimenting, and the 17-page document are merely small signs of my complete insanity! I'm just grateful that Rhonda indulges me, and we do, indeed, have a great time pulling it all together.